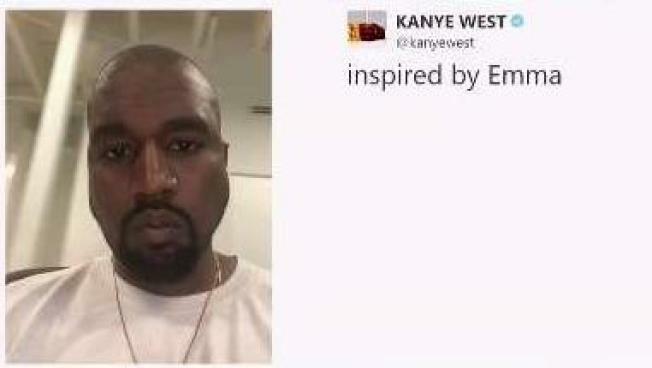 Outspoken rapper Kanye West recently posted that he was inspired by MSD survivor Emma Gonzalez. Fresh off his tweetstorm in support of Republican President Donald Trump, Kanye West is embracing a public figure seen as a leader on the opposite side of the political spectrum: Parkland shooting survivor Emma Gonzalez. "My hero Emma Gonzalez," the rapper tweeted Saturday night, along with a photo of the 19-year-old high school senior, who has become a national leader in the gun control movement in the wake of the Feb. 14 mass shooting that left 17 dead at the Florida high school. A short time later, West posted a selfie with the caption "inspired by Emma." Gonzalez, who has amassed more than 1.5 million Twitter followers in the wake of the shooting, responded with a tweet and photo of her own. "My hero James Shaw Jr.," she wrote. Her tweet references the 29-year-old father credited with saving lives by tackling the gunman during a deadly shooting at a Tennessee Waffle House earlier this month. West's earlier tweets declaring admiration for the GOP president drew praise from conservatives but were met with anger, criticism, and confusion from fans and supporters on the left, including some fellow Hollywood A-listers. West, who has been flooding the social site with tweets on a wide range of topics, said in a subsequent post that he doesn't "agree with everything Trump does."